The most important part of the most beautiful weddings is menu choices. Bride and groom make their menu choices carefully to make their wedding guests happy. Dear wedding couples, you should not worry at all if wedding menus complicate your minds and you feel like you can not handle with all these options. We are here for you. We make researches on different kind of menus menu by menu and prepared sample menus in our wedding packages. We try to support the wedding couple by preparing menus according to their culture with our wedding partner hotels as we are experienced international wedding operator. To choose the best menu for you and your wedding guests, you should make some studies. Advices from your wedding venue and your wedding organizer can give you some samples. If your wedding is with dinner reception then you can be sure that the heart of the guests will be opened by food. As everybody nows, you can not see your wedding guests on the dance floor with an empty stomach. This is why we suggest you to check menu types of your wedding venue. We are sure that you will make the best choice after this article. Are you ready to have a little trip? What is a Wedding Menu? Your wedding venue and wedding operator company will offer you lot of different menu types whichever wedding menu you choose, the main thing you should do is to make choices according to everyone’s taste. Yes, we know that this is not easy but if you do not choose assertive meals and offer your wedding guests alternative wedding treats, you can easily overcome this problem. You may choose cocktail, cocktail prolonge, open buffet and a la carte for your wedding. Now we should check these set menu options. Cocktail menus are usually preferred for receptions after marriage ceremony, however if your wedding guest list is crowded, you can choose this option also for your wedding. In this way you both do not access your budget and your wedding guests will not wait too much for their meals. If your wedding guests’ average of ages is high, 2-hour cocktail will be very suitable for your wedding. This is because after 2 hours elder guests will get tired and cannot enjoy the wedding as they wish. You may arrange some sitting areas for these guests during your wedding cocktail. Cocktail is one of the most economical reception menu types. Waitresses serve chips, dried nuts and fruits, cheese, treats, and galantine vegetables on trays to the tables. Now we will make it easier for you by listing these kinds of cocktail menu samples. You may offer to your guest cheese balls with parsley and flaked red pepper, afterwards pumpkin roll and roasted pepper. You may add spicy chips, carrot and cucumber slices into the menu. The last but not the least, you may serve chocolate and fruit cupcakes to your wedding guests. You should also decide if you want limitless or limited alcoholic drinks during your wedding according to your budget. If you convinced on limitless alcoholic drinks, you can serve different cocktails such as martinis to your wedding guests. Besides these delicious treats for your wedding guests, you should also be pleasing to their eyes with your wedding venue decoration and enrich your wedding reception with elegant touches to your cocktail table. 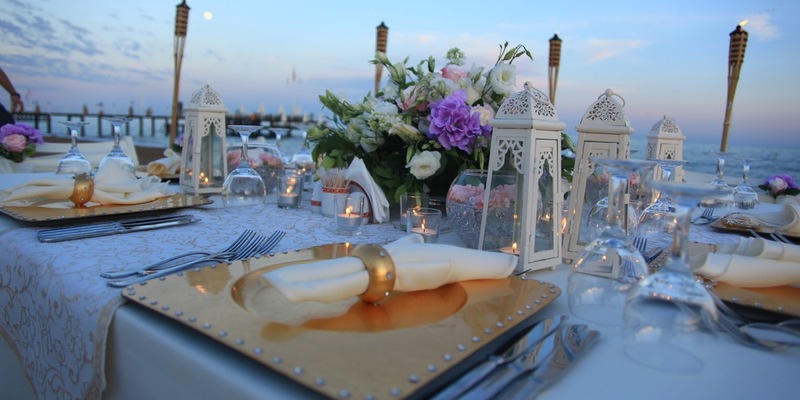 Wedding City Antalya will organize your dream wedding as you wish. If your cocktail will last more than 2 hours, this type of reception is called ‘’Cocktail Prolonge’’ and it means you need a more comprehensive menu. Again, you may consider cocktail prolonge after marriage ceremony or during your wedding reception. Especially 2-3 hours in the evening is ideal for celebration. In this kind of wedding reception, you should be careful to choose satisfying treats. Treat types should be richer than cocktail in cocktail prolonge however it is also a budget-friendly option for weddings. We can advise chicken pieces with sauce, mini meat balls, kebab and mini pizzas as appetizers. Besides, you may serve little breads with sauce on them as appetizers. You have also options such as mini pastry rolls, mozzarella sticks and mini chocolate brownies as dessert. If you also wish for giving a place to seafood in your wedding menu, salmon in pancake can be a nice alternative. For drinks, you may prefer fresh lemonades and different types of alcoholic cocktails. Open buffet menu is ideal for crowded weddings. Even if there will be more people for your wedding than you expect, you won’t have to refuse people by means of open buffet. Your wedding guests either can stand or sit during the open buffet. In this menu type, all food and treats are served on large tables and it is expected for wedding guests to serve themselves. To avoid long lines, you should be careful to organize your open buffet at least for 100 people. In some crowded weddings, open buffet tables decorated largely and two sided. In open buffet menus foods are usually served in 3 groups; Cold, hot and dessert. Every buffet has its own special plate, fork and knife. During open buffet option, first cold treats should be eaten and then hot plates. It is important to have meat and vegetable options for main meal. After the main course fruit and dessert buffet should be visited. Open buffet menu types give you a chance to be free on your choices. You can serve Russian salad, seasonal sautés, mini meat balls, mini cheese rolls, and risotto balls with spinach sauce before the main course. For main course, you can choose barbeque sauced rissole, if your wedding guests’ average of ages is young, you can easily serve pizzas. You can be sure you will get full point from your guests. For dessert buffet, you can give a place to different types of cookies, cakes and donuts. It will enrich your open buffet to serve little from different kind of foods. For drinks, you may consider to serve juices and cold champagnes. If you give a place to decorative tables during drink service, you can be sure that it will be approved by your wedding guests. This menu type is the most preferable menu type for weddings. Wedding guests sit on wedding tables and the meals which are chosen by wedding owners are served to their table one by one. If you consider choosing this kind of menu for your wedding, you should allocate more budget than the other menu types as this menu type requires much more staff and pre-preparing. If you request to be informed about the latest trends of 2018 and reflect these trends on your wedding table, our international wedding operator wedding city Antalya which has all the knowledge about wedding decoration will help you accordingly. We suggest you to check wedding albums in Wedding City Antalya’s official web page to have an idea. a La Carte Menus usually consist of appetizers, starters, first courses, main courses, desserts, wedding cake and drink service. This kind of wedding reception should be held in a wedding venue which gives an option for professional services because if the wedding group is crowded, there should be some experts to host and serve them.